I received my Wealthy Way Oil in the mail this weekend. I don't have any set spellwork to use it for. I put it on my person, mailbox, doorknobs to attract wealth. Is this in ANY WAY effective? Are there any other ways to use Wealthy Way Oil? Good luck with your ascent to personal wealth! I know that Money Drawing Oil brings money onto itself, and that Money Stay With Me Oil helps you keep it, but I am just wondering what the basic difference is between Prosperity Oil and Wealthy Way Oil? They are different recipies with differing ingredients, but similar intent. While I am not privy to Lucky Mojo's methods, I believe that they represent the different recipes collected, learned, and developed. The names of Money Drawing Oil and Money Stay With Me Oi describe them well by their titles. Prosperity is a recipe for business success and for long-term financial stability. It both draws money AND causes money to stay, as well as preventing losses though bad investments. Wealthy Way is a bit more showy; it gives you the appearance of wealth, the style, as it were, and the look of financial success. It is flashy and luxurious. Use Wealthy Way Oil when you want spending money for vacations, jewelry, a new car, better clothes. Dress candles with it, anoint your jewelry with it, or wear it on your person when you wish to have enough money to bet and play. Use Wealthy Way when you are strutting your stuff. "How To Do a 7 Knob Candle Spell for Money & Prosperity"
We greatly appreciate being selected as her chosen﻿ supplier and we fully support the instructions she gives through her video outreach. Thank *you* so much, cat! I have a lot of clients who would ask "how do a use a 7 knob candle?" and so making a video seemed like the thing to do. 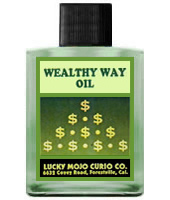 I love Wealthy Way and so do my customers - we love ALL the Lucky Mojo products. I love showing customers the back side of the bottle so they can see the botanicals and minerals and letting them smell the oil. In fact, I just had a client come in the other day and he looked at the Black Cat oil from the back, saw the black cat hair in it and was mightily impressed. Just a look and a smell is all it takes and they're sold! Thanks for making a great product that I can heartily recommend with genuine enthusiasm because it works! This was a big help in distinguishing the various money oils. I love Wealthy Way, and think it smells like Christmas, which to me fits with its "showy" attributes. My desire would be to have the wealth to afford a house in a different state and live comfortably there. I have wealthy way oil, magnet oil a seven day candle, and a large lodestone, and magnetic sand. As a spell idea, I was thinking to inscribe my candle with my petition and annoint with a mix of magnet oil and wealthy way to draw money in. For seven days, I intend to feed my lodestone (that's been annointed with the same oil mix) with magnetic sand. For my petition paper, could I use a photo of houses for sale and cash as my "personal concern?" If so, could the cash be used as hunting money? Could wealthy way be used in this manner? Name the lodestone and baptize it, in this case to draw in wealth. I would make a petition paper that includes a hair of yours since its a better concern. Placing money under the stone is traditional, cat talks about hunting money. Wealthy way is more then just a house its also a lifestyle. I would wear the oil on yourself, dress your money with it, continue to feed the lodestone after the candle is spent. Consider adding cinnamon as well to draw money and luck with money. I would do both. It goes in the candle, and a sprinkle of it mixed with other herbs, green glitter, sachet powder etc. Regarding the lodestone, after the completion of the 7 day candle, how often would I feed it? Weekly?